Dr. Garrett has been performing strabismus surgery successfully for 32 years without a single complication. Garrett Eye and Dickinson Memorial Hospital has an excellent team of anesthesiologists with a proven safe track record for pediatric anesthesia. Strabismus is a condition in which both eyes do not look toward the same object together. Strabismus is often called “cross-eyed” or “wall-eyed”. Strabismus most often begins in early childhood. It is estimated that 1-5% of children have strabismus. 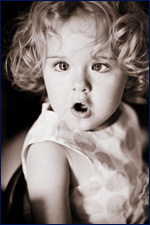 Childhood strabismus often has no known cause, although it tends to hereditary. Normally, the muscles attached to each eye work together to move both eyes in the same direction at the same time. Strabismus occurs when there is a lack of coordination in the eye muscles that prevents the eyes from gazing at the same point in space in unison. When the eye muscles do not work correctly, the eyes may become misaligned and the brain may not be able to merge the two images. Adults may also develop strabismus from eye or blood vessel damage, loss of vision in an eye, an eye or brain tumor, Grave’s disease, stroke, and various muscle and nerve disorders. The most common visible sign of strabismus is when a child’s eyes do not look at the same point in space at the same time. Newborns often have crossed eyes due to a lack of developed vision, but this disappears as the infant grows. True strabismus does not disappear as the child grows. Children with strabismus often squint, close one eye in bright sunlight, and tilt or turn their head to look at an object. The child may also complain about blurred vision, tired eyes, and sensitivity to light. Strabismus also can cause double vision. During an eye exam, ophthalmologists (MD) and optometrists (OD) often can tell a child has strabismus just by looking in their eyes. The doctor may have the child look at an object while covering and then uncovering each eye. This allows the doctor to determine which eye turns, how much it turns, and under what circumstance the abnormal eye turn occurs. These tests will also help the doctor determine whether the child has amblyopia, often called “lazy eye.” In amblyopia, one eye is not used enough for the visual system in the brain to develop properly. The most common treatments for strabismus are vision therapy including patching or visual exercises, glasses with the correct prescription or bifocal or prism correction to aid in proper focusing, eye drops to help focus, and finally, surgery in some cases. Surgery is often the only way to correct severe strabismus. During surgery, the Dr. Garrett changes the length or position of the muscles attached to the eye to help it align better. He employs the advanced Park’s Cul du Sac technique to minimize the trauma to the eye and speed recovery. Children do not outgrow strabismus! Early detection and treatment are needed to correct the condition. Children with strabismus may initially have double vision. This occurs because of the misalignment of the eyes in relation to each other. The brain will eventually disregard the image of one eye (called suppression) in an attempt to avoid double vision. If left untreated, a child may irreversibly lose vision in one eye.